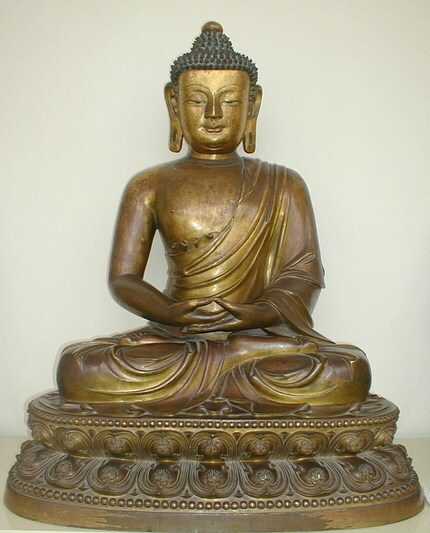 Buddhism is based upon the teachings of Siddhartha Gautama, an Indian prince born in approximately 563 BC. Siddhartha began his spiritual quest at the age of 29 which lead 6 years later to his enlightenment under the Bodhi tree (‘tree of wisdom’) at Bodh Gaya in Northern Indian. He became known as the Buddha (the enlightened one). He lived to the age of about 80 and when he died he had a following of approximately 500 disciples. Buddhism grew dramatically during the reign of Emperor Ashoka (268-239BCE.) He converted to Buddhism. As his Empire covered much of India, Buddhism spread throughout it. He also sent missionaries off to other lands. It is said that his children introduced Buddhism to Sri Lanka. By the 1st century AD it had spread to China, largely due to the opening of trade routes from India. By the13th Century BC however Buddhism in India had declined. This was partly due to the destruction of the monasteries by the Muslim invaders, but also because it simply became re- absorbed into Hinduism. Buddha came to be seen as another incarnation of the Hindu god Vishnu. The 20th century saw its arrival in the west. Here it has attracted new followers. Westerners have found that its lack of dogma its focus on the individual and emphasis on personal experience and its concerns about the environment fit comfortably with modern trends.